The Lagos State police command has arrested two notorious shop looters at the Trade Fair international complex, Ojo, Lagos. Commissioner of Police, Imohimi Edgal, told newsmen that the burglars had been robbing shop owners in Balogun axis of millions of naira. 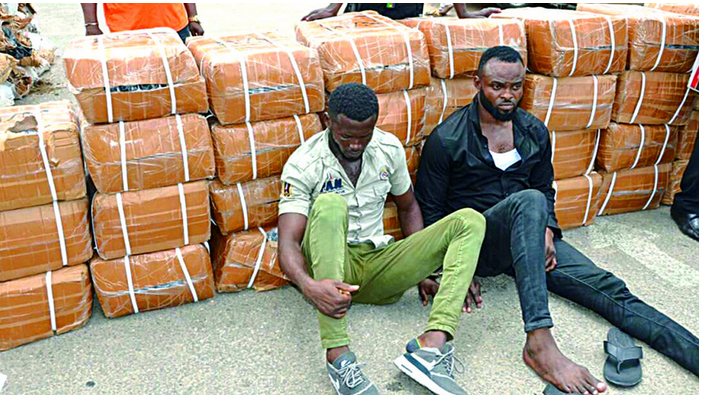 According to Edgal, “we don’t want to bore you with a story of burglary, however, what makes this one unique is that the culprits were caught in the act carting away goods worth millions of naira at the Trade Fair Complex, on Lagos-Badagry Expressway. “On April 26, at about 2:00a.m., the DPO Trade-Fair Division, Sunny Akaeze, got a tip-off that a syndicate specialising in breaking and looting shops at Trade Fair Complex are about to operate in BBA arm of the complex. “Based on the information, the DPO dispatched his operatives to the Kaduna Plaza Shop D-108 on surveillance. Eventually, one Ifeanyi Okafor, 30, of No. 4, Ayo Shobowale Street, Ira-Ojo, Lagos and Okonkwo Nnamdi, 30, of Shop 108, Kebbi Plaza BBA were apprehended with 39 cartons of snickers footwear worth millions of naira. “During interrogation, it was discovered that the first suspect, Okafor, was a failed trader within the complex. He went bankrupt and sold his shop. He decided to take to stealing to launch himself back to business. The second suspect, Nnamdi, on the other hand is a shop owner. Recovered from the suspects included one saw-blade, used to burgle a Chinese shop in the complex, one damaged padlock used by the Chinese to lock his shop. Investigation is in progress and the suspects would be charged to court soon,” he said. 0 Response to "Notorious Looters Arrested While Stealing Goods At Trade Fair Complex (Photo)"